As one gets a feel for fragrances, they inevitably begin to pick out notes that appeal to them; these may even be broad classifications, as wide as colour schemes or using a musical and/or visual-art based lexicon to grasp fragrance. I was lucky with this one, Memoir Man, as it happened to contain my favourite set of brooding notes exalted with equally loved aromatic greenery – basil and mint – crossed with the anisic and spicy pungency of wormwood, an almost alchemic ingredient redolent of fennel and liquorice. Memoir Man piques my interest as it delivers a refined tannin quality rounded in green and then ceremoniously left to smoke. A gloriously narcotic fragrance. Memoir Man for me doesn’t only defy fougère conventions, but it also establishes new and broader conventions ultimately challenging the critical faculties. In this instance, male facets are explored and given a touch of quality that many male fougère fragrances miss. A musty lack of quality is unfortunately too present in many fougère works today. What Amouage does, and of course does best, is give fragrance the high-brow treatment with richness through the quality of ingredients including the raw materials. Often when sharing Amouage fragrances around, buzzwords like ‘quality’ and ‘dense’ are repeated without hesitance; a testament to Amouage’s creative processes and prerequisites. As described by Amouage and loosely edited by myself: ‘The Memoir fragrance explores the ‘space’ [and thusly the blur] between man and woman as both this and its female counterpart veer away from traditional constructs of sentimentality in favour of new objectivity and individuality.” Totally modern and innovative, Memoir Man is often totally and undeniably masculine – only softly suggesting a light delicacy popularised in feminine works. A moist richness, per se, clashing with cool and crisp with an oakmoss veneer. This is how I interpret Memoir Man. Memoir Man opens like an aggressive storm in a teacup. It is an outstanding, wonderfully contrasted fragrance that deconstructs the general [masculine] fougère accord and augments it with a thundering and medicinal herbal quality made sultry and pressing. Put simply: ‘Intensely aromatic’; the bitter camphorous notes are pleasantly sort of mentholated and icy-crisp that eventually evolves with a huge chunk of dried and charred accords revivified with a tenacious ‘out of nowhere’ yet undisguised creaminess. From purely a compositional point of view, Memoir Man contains all elements of the popularised aromatic-fougère, with lavender, woods, and oakmoss highlighted with herbs and mint. A whack in the face opens, a burning trail of exotic yet romantic incense, cooled with absinthe and mint. The fougère blueprint at this stage builds up, with lavender making an appearance through the cloud of incense smoke. The leather note drives the blend imperiously, somewhat sadistically to greater lengths of deconstruction and aberration. Two different woods at this stage bout, as guaiac wood delivers a dark sticky tar-like vibe mitigated with creamy sandalwood and vanilla. Eternally mentholated, the tobacco note adds a strong masculine edge against the balmy smoke notes merged with a sophisticated musk that is never slouchy – but rather, prim and cleansing. The oakmoss adds to this effect, adding a sensuous quality to the heart of the fragrance with a headstrong outdoors character also. Finally, I am reminded of La Belle Époque characterised by what I can only describe as an innocent ignorance. The view of absinthe during the period for example, was of something that was benumbing whilst also being equally dark and dangerous. Green fairies come to mind, a favourite theme of mine, reminding me of spiced forests at dawn, tinted infinite shades of green and black. As with the alcoholic hallucination, eventually the fairy disappears with its only remnants being a mellow completion of vetiver in the dry down. Alternatives: Fou d’Absinthe by L’Artisan; Sycomore by Chanel; and Vetiver by Lubin. A confident masculine man is not strictly masculine. A confident masculine man embraces delicacy and distinction drawn from the heterodox; the subtle surprises in our world; beyond sense and reason. Let the top notes sparkle and fade into the fabulous grotesque of deconstruction and fracture done perfectly. This entry was posted in Amouage and tagged absinthe, Amouage, fougere, Fragrance, masculine, memoir, memoir man, Perfume, Review, scent. Bookmark the permalink. I love this review Liam. 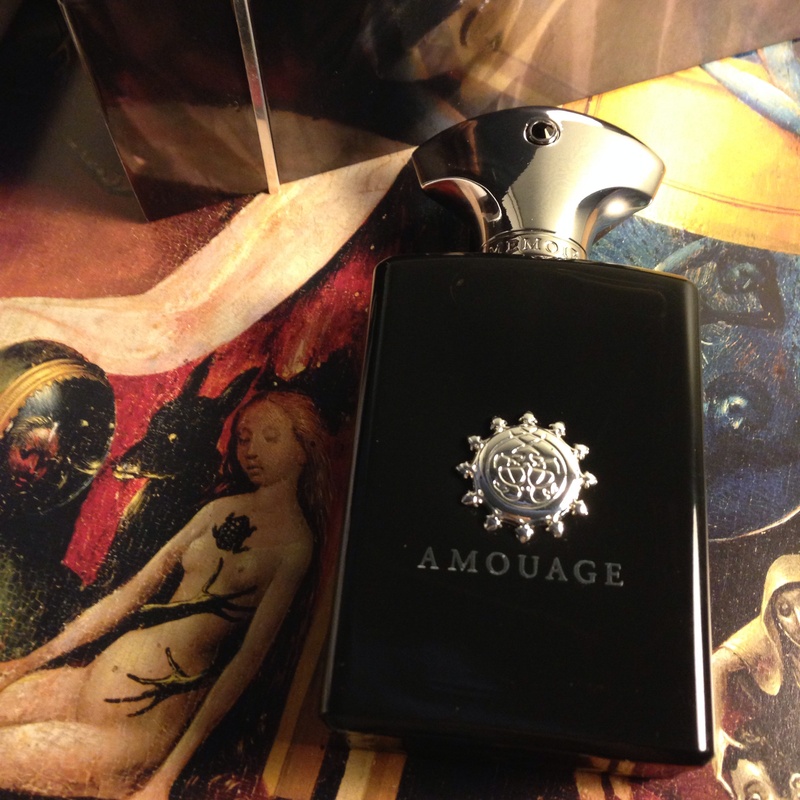 It is one of the few Amouage`s that i find works well with me. Hi Richie – good to see you here. Memoir Man is truly a sophisticated fragrance. I appreciate most Amouage works but very little work on my skin too. Journey Man and Silver Cologne I find love my skin. Also, thank-you for your kind words. Liam, coincidently I wore Memoir Man for the evening. It is underrated in comparison to the rest of Amouage’s lineup.